At the Australian Laser & Skin Clinic, beauty is our passion. However staying up to date on the latest and greatest in beauty isn’t as easy as it looks. While the traditional magazines and news outlets give us the big picture, it’s the independent bloggers that are fast becoming the true tastemakers of the beauty industry, building organic and loyal readerships that follow them at their every word. With thousands of Australian beauty blogs at your fingertips, we thought we’d compile some of our favorite Australian beauty bloggers to help you get in the know! So here it is, the Australian Laser & Skin Clinic’s 5 Favorite Australian Beauty Bloggers. The Plastic Diaries is the brainchild of Kimberly Nissen, a former publishing coordinator at ACP Magazines. At The Plastic Diaries, content quality is the name of the game. Kimberly’s print background is an excellent asset to The Plastic Diaries, giving it a professional tone that sets it apart from the pack. The Plastic Diaries’ posts are lengthy, informative and packed with the kinds of details most beauty blogs miss. The most impressive aspect of The Plastic Diaries however is the social community that has been built around the site. With regular giveaways, reader polls, frequent updates and a strong social networking presence, The Plastic Diaries has one of the most dedicated and diverse readerships in the beauty blogosphere. Indulgent Beauty Reviews is the perfect example of why we’ll take a blog review over a traditional beauty review any day of the week. 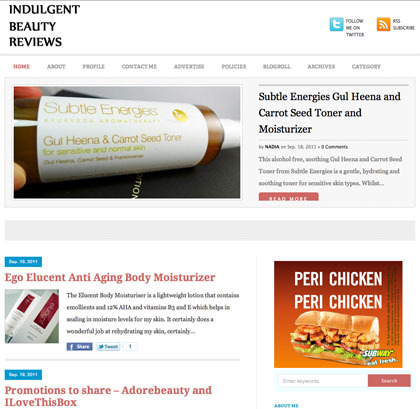 Written with true passion and infused with the personal style of writer and owner Nadia, Indulgent Beauty Reviews focuses almost entirely on consumer beauty product reviews. Nadia’s laser focus on product reviews results in some of the most in-depth and honest reviews you’ll find in the beauty blogosphere. Don’t let the name fool you though, Nadia’s blogs on a huge range of products, from luxury beauty products all the way to daily amenities we all use, making her blog the perfect destination when you need the lowdown on that new hand cream or fragrance. 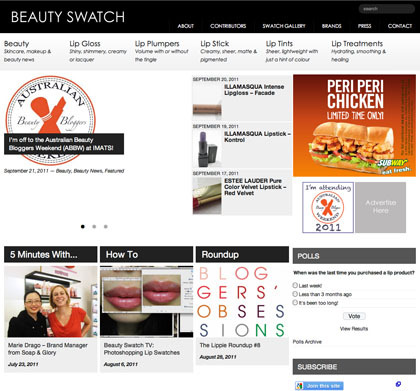 Beginning its life as an online color library of makeup colors, Beauty Swatch has evolved into one of Australia’s premier sources of beauty news and product reviews. Running with the idea that different beauty products look different depending on skin and lip colour, Beauty Swatch aims to present a more personalised experience with contributors of all colours and shades. It’s a formula that’s been working, allowing Beauty Swatch to expand into skincare, makeup and beauty news as well as remaining focused on it’s lip-oriented origins. With the sheer amount of contributors, Beauty Swatch is constantly being updated, resulting in a large back catalogue that will help you decide on the perfect beauty products for your skin tone. With a great image-based magazine-style design, Beauty Swatch is a joy to browse through, ensuring you’ll come back for more. Written by Malaysian-born, Melbourne-based Valerie Chan, Ponikuta is the perfect example of what an Australian beauty blog should be. It’s informative, unique and oozes a passionate writing style that turns the most mundane product reviews into must-read articles. Whether you’re after beauty tips, product reviews or even coverage of major beauty and fashion events, Ponikuta has you covered in a style all her own. Ponikuta’s playful design and excellent personal product knowledge make it one of the most entertaining reads in beauty blogging. While starting a beauty blog is as simple as can be, finding a unique angle and niche in the beauty blogosphere is harder than it sounds. The Clean Beauty Blog is the perfect example of a successful niche beauty blog, showcasing the finest beauty products that are clean, green, natural or organic. 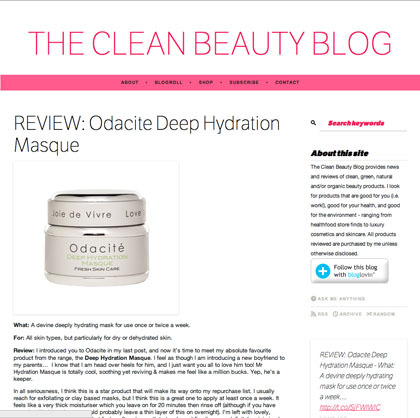 Despite only starting up a few months ago on Tumblr, The Clean Beauty Blog has delivered a series of consistent, high-quality product reviews, trend spotlights, tips and tutorials, quickly establishing it as the premier destination for beauty products that are good for your health and the environment. From cruelty-free certified beauty products to chemical-free makeup, The Clean Beauty Blog has all your clean beauty needs covered. Know a blogger we missed out on? Want to share your own beauty blog? Send it to us on Twitter or Facebook!